Sales director of Ferretti, Mr. Stefano de Vivo is nothing but proud of the latest Ferretti Yachts model: ‘The 850 is a key model for its series. Fresh design and exquisite performances make this yacht appealing at first sight, even before you see the interior, reminiscent of modern lofts.’ We first met the 850 in Cannes last year. The 85-footer’s exterior and interior were designed by Zuccon International Project and the yacht carries several trademark elements of the studio, like the raised pilot house allowing for spacious volumes under and around it. From the side, the new Ferretti is dynamic and well balanced, with both of the elements hinting at roomy interiors. 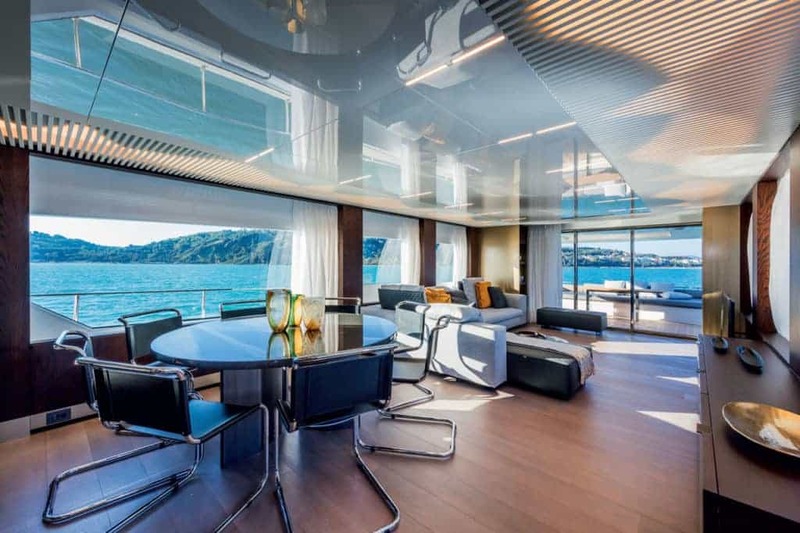 The designers probably spent most of their time on glass surfaces, which have all bee redesigned – the single-piece superstructure side surfaces, the large trapezoidal hull windows that guarantee the view from the cabins. Glass surfaces have since the beginning been the most recognizable feature of the series, limited to larger models (over 80 feet). The new Ferretti was designed for warm parts of the world with plenty sun, so the exteriors are a sun-lover’s dream. The two aft staircases lead directly into the cockpit, the innovative Dual Mode Transom allows opening the aft platform into a beach club, or submersing it for the launch of the Williams 385 tender. The cockpit is a typical salon-diner combination, with all elements of deck equipment carefully hidden from sight. Up on the fly, accessible via staircase from the cockpit, there’s enough room for anything. The fly deck can be customized, and the unit we tested had the secondary command post with two seats on the bow, a bar and a galley. 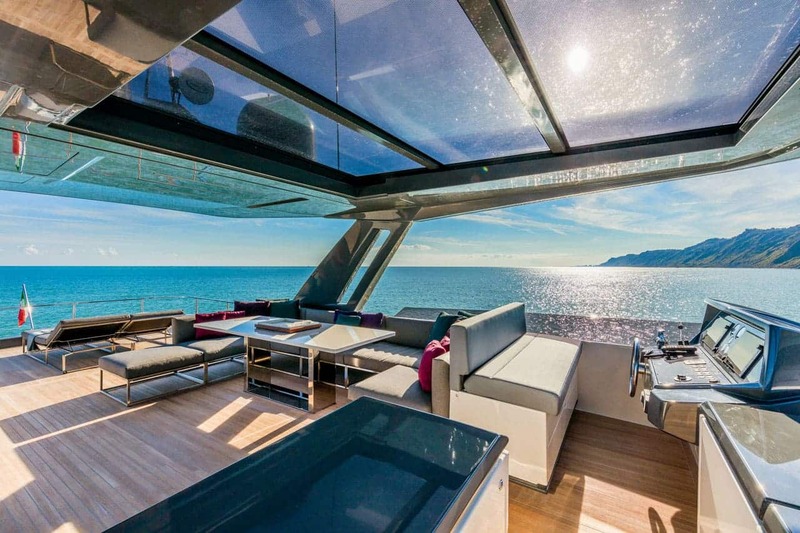 We have loved the fly, as it is the most relaxing space aboard, in part due to the atmosphere created by the hard top with glass elements allowing in just the right amount of sunshine. On the bow of the main deck we have discovered another salon, with a large sunpad and height-adjustable sofas, very cozy and well protected from intrusive views in the marina. This space can also be protected by one or more biminis. From the aft cockpit, we began exploring the interior. Beautiful glass sliding doors connect the cockpit with the interior, a ten-meter long space divided into a salon and a diner. Ferretti 850 did not immediately remind us of any other modern yacht – the designers avoided all the usual choices, even when it came to fabrics, creating a modern icon and potentially the referential model for the class. The main deck reminded us of a loft or a villa, due mostly to the work of the designers, but in part due to unusual engineering solutions that allowed the space to grow. Land architecture found its way to the sea with this model that disregards completely the usual wavy geometry. Tall and wide glass surfaces are overall impressive, both in size and shape, and surround almost the entire main deck without interruption, enforcing the idea of a loft. The diner is huge, with a large table that seats eight, and only separated from the hall behind it by a metal and glass bookshelf. This original structure seems to be afloat mid-air, hiding from view the staircase leading below deck. The salon is connected to the command post on the bow by a ceramic element with stone finish. Next to the salon and the diner on the main deck are the galley and the raised command post, served by doors leading outside. The galley is available in two versions, and the one on the unit we tested was located in front of the command post, on the bow, and equipped by Italian designers, primarily Ernestomeda. Next to the super modern galley we have found another staircase, this leading below deck and toward the crew cabins, and another, smaller dining space. Below deck the 850 has enough space for very large, very comfortable cabins. The master is furnished by Minotti and similar in style to the main deck salon; with a centrally placed bed, a mini studio, a wardrobe and plenty of storage. The private head connected to the master is large and elegant, with a shower and two sinks. Guests can choose from one of the two double VIP cabins; one mid-ship and port, the other one in the bow. The fourth cabin is a double located mid-ship and starboard. All cabins are served by private heads. Ferretti 850 can be powered by 1800-hp MAN V12 or 1900-hp MAN V12. The less powerful set allows for 29 knots of top speed and 26 knots of cruising speed, while the 1900-hp engines increase cruising speed one knot and raise top speed up to 30 knots. In addition to the engines, the client cans elect stabilizers, with a choice of Zero Speed or Seakeeper. Built up to highest standards, Ferretti 850 is the ideal yacht for those looking for a floating villa. Modern, cozy and extraordinarily spacious, it is a typical Ferretti in every way, and the brightest star in their current line-up.